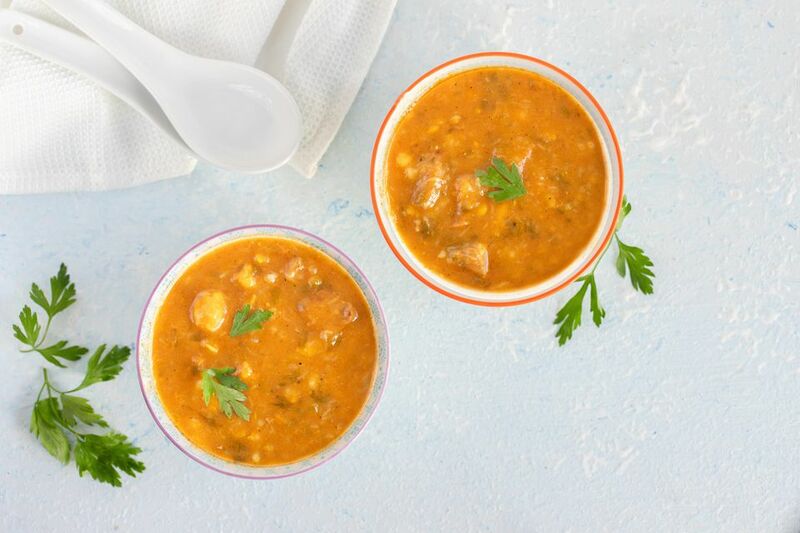 ​Harira is an authentic Moroccan soup made of tomato, lentils, and chickpeas, but also includes meat, making it a filling and satisfying dish. There are many variations, and recipes are often passed down from generation to generation. Some versions, such as this one, feature broken pieces of vermicelli and smen—a preserved butter with a Parmesan-like taste. Harira recipes yield a delicious, hearty soup which can be served as a filling lunch or light supper. Although served year-round, it is particularly popular during Ramadan, when it is served to break the fast. The recipe follows the pressure cooker method which speeds up the cooking. To adapt cooking times for traditionally simmering in a stockpot, follow the directions for the traditional stockpot method. Before proceeding with the recipe, read the steps in advance for a simpler cooking process. Wash the herbs and drain well. Pick the parsley and cilantro leaves from their stems. Small pieces of stem are all right, but discard long, thick pieces with no leaves. Finely chop them by hand or with a food processor. Peel, seed and puree the tomatoes in a blender or food processor. Or, stew the tomatoes and pass them through a food mill to remove the seeds and skin. Pick through the lentils and wash them. Put the meat, soup bones and oil into a 6-quart or larger pressure cooker. Over medium heat, cook the meat for a few minutes, stirring to brown all sides. Add the cilantro, parsley, celery, onion, chickpeas, smen (if using), spices and tomatoes. Stir in 3 cups of water. Cover tightly, and heat over high heat until pressure is achieved. Reduce the heat to medium, and cook for 20 to 30 minutes. Remove from the heat and release the pressure. Add the lentils, tomato paste mixture, and 2 quarts of water to the stock. Set aside (but don’t add yet) either the rice or vermicelli. Cover the pot and heat the soup over high heat until pressure is achieved. Reduce the heat to medium and continue cooking. If adding rice: Cook the soup on pressure for 30 minutes. Release the pressure, and add the rice. Cover, and cook with pressure for an additional 15 minutes. If adding vermicelli: Cook the soup on pressure for 45 minutes. Release the pressure, and add the vermicelli. Simmer the soup, uncovered, for 5 to 10 minutes or until the vermicelli is plump and cooked. While the soup is cooking, make a (soup thickener) by mixing together the 1 cup of flour with 2 cups of water. Set the mixture aside, and stir or whisk it occasionally. The flour will eventually blend with the water. If the mixture is not smooth when you're ready to use it, pass it through a sieve to remove lumps. Once the rice (or vermicelli) has cooked, taste the soup for seasoning. Add salt or pepper if desired. Bring the soup to a full simmer. Slowly — and in a thin stream — pour in the flour mixture. Stir constantly and keep the soup simmering so the flour doesn’t stick to the bottom. You will notice the soup beginning to thicken when you've used approximately half the flour mixture. The thickness of harira is up to you. Some like to thicken the broth so that it achieves a cream-like consistency. Simmer the thickened soup, stirring occasionally, for 5 to 10 minutes to cook off the taste of the flour. Remove the soup from the heat and serve with some parsley. If the meat had a lot of fat, expect to see some foaming as you simmer the thickened soup. Skim off the foam and discard it. As harira cools in the pot, it’s common for a skin to form. Simply stir to blend the skin back into the soup. A small wedge of lemon may be served as a garnish; its juice may be squeezed into the bowl of harira. When reheating harira, don’t bring it to a boil. Heat over medium heat and stir frequently to avoid lentils sticking to the bottom. Preparation Shortcut: Chop your cilantro, parsley, and celery together in a food processor or blender. Add the peeled and seeded tomatoes, and blend until well-pureed. Add the onion and process until the onion is reduced to small pieces. Proceed with making the stock. Thickening with Egg: In place of flour and water, 2 or 3 beaten eggs may be used to thicken harira. (If desired, beat the eggs with 1/4 cup fresh lemon juice.) Add the eggs in a thin stream to the simmering soup, stirring constantly. You will see some cooked strands of eggs in the soup as it thickens. Prep and Freeze: If you plan to cook harira frequently, it’s helpful to prep large amounts of key ingredients in advance. Soak and peel chickpeas and drain well before freezing. Chop an ample supply of parsley, cilantro, and celery; measure the mixed herbs by soup bowlfuls and freeze. Peel, seed, and stew tomatoes; puree and freeze in about 2-pound batches. In the "Make the Soup" section, partially cover the pot, bring to a simmer, and cook for double the suggested pressure cooker times. Watch the level of the liquids. You can add a little more water if you feel it's necessary. Proceed with thickening the soup according to the recipe, or try the egg thickening method in the Tips section outlined above.